What does Mold on a culture look like? 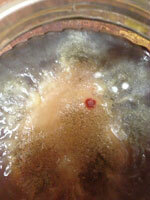 Kombucha culture mushroom mold is a growth of dark coloured fuzz. It can be green, black, white or grey mold, but it is always fuzzy. It is caused by mould spores landing on the culture. If mould developes throw the batch out and start again. You do NOT want to ingest mould spores. It is important to add at least 10 - 15% fermented Kombucha Tea at the start of each new batch to help reduce the risk of mould. The feeding solution, mother tea or ferment that is added to each new batch makes the solution acidic, and moulds tend to not grow well in an acidic solution. If you don't have enough mother tea you can use approximately ½ to 1 regular spoon of DISTILLED (boiled for 10 minutes and cooled) vinegar per litre of tea. Remember, this is only if absolutely necessary. A good idea is to use disposable paper towels, tissues, clean handkerchief, anything that will allow the kombucha brew to breath but not allow mold spores in - always secure it with a rubber band. The cloth also needs to be very clean. Try not to place the fermenting brew in situations where mold is common eg: on the floor, under the sink, in a shower stall, in the bathroom, in the laundry room, in the garage. 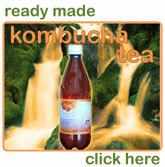 Other places that are not good are: The kitchen - The steam and fat odors are detrimental to the growth of Kombucha. Next to pots - There may be damaging bacteria in plant soil. Any room in which cigarette or similar smoke can occur is an absolute no! Cigarette smoking causes mould to grow on top of the culture. My favourite method is to fill a spray bottle with distilled vinegar (white vinegar boiled for 10 minutes and cooled). 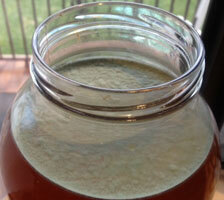 Spray the top of the brew every couple of days until you feel that the treat of mould has gone.